By Dan Ambrose: WBO light heavyweight champion Sergey Kovalev (25-0-1, 23 KOs) sees his upcoming match against 49-year-old IBF/WBA light heavyweight champion Bernard Hopkins (55-6-2, 32 KOs) as being a potentially easy fight for him when he steps inside the ring next month on November 8th on HBO Championship Boxing from the Boardwalk Hall in Atlantic City, New Jersey, USA. Kovalev feels that as long as he does what he’s done before in his fights and in terms of preparation, then this could very well be as easy fight for him as it’s been in the past. Kovalev hasn’t had a fight go to decision since 2011, and it’s going to be tough for Hopkins to try and go the distance with him. “If everything is the same, it will be an easy fight,” Kovalev said to the nypost.com. Kovalev will likely start off fighting in a relaxed manner like he does against a lot of his opponents, but once Hopkins tried to push the pace then Kovalev will start to unload on him with his ammunition. 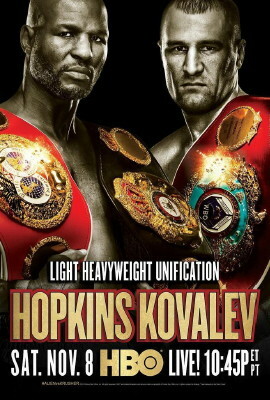 It’s unlikely that Kovalev will come out quickly in the 1st round because he knows Hopkins will be looking to tire him out by covering up with his shoulder roll defense. Hopkins isn’t going to win this fight unless he opens up with his artillery. He’s not going to be able to pot shot his way to a victory like he did in his last fight against Beibut Shumenov last April. Kovalev will land too many bigger blows, and there’s no way that the judges will give Hopkins a decision with him getting nailed with far more shots unless the judges are inclined to score rounds for occasional pot shots instead of to the more active fighter. “I don’t have to do anything special for Hopkins. I just have to do the same work I’ve been doing for every fight. I’m preparing the same, like I would prepare for any fight. For me, all the fights are very important in my boxing career,” Kovalev said. Kovalev has a lot of respect for Hopkins, but obviously he’s not going to put him on a pedestal based on his recent wins over Shumenov, Tavoris Cloud and Karo Murat. It’s been two years since Hopkins fought a good opponent in Chad Dawson, and he lost that fight soundly. Murat, Cloud and Shumenov are not great fighters, and that’s obviously why Hopkins has been able to extend his career a little while longer. Had he been fighting the likes of Kovalev, Artur Beterbiev and Adonis Stevenson in his last three fights, Hopkins’s career would be in a much different situation than it is right now.